The Advisory Groups are the key fora for clinicians and scientists to meet with representatives from NHS Blood and Transplant (NHSBT), commissioners and Departments of Health and others to review and develop policies, assess outcomes, and work with partners and stakeholders to improve outcomes for patients. The structure and role of the Advisory Groups has recently been reviewed (see link) and recommendations made from which changes will be implemented. The Chairs, who are all elected with independent input, meet at the Chairs of the Advisory Groups Committee. The Advisory Groups report to the Organ Donation and Transplantation (ODT) Senior Management Team. 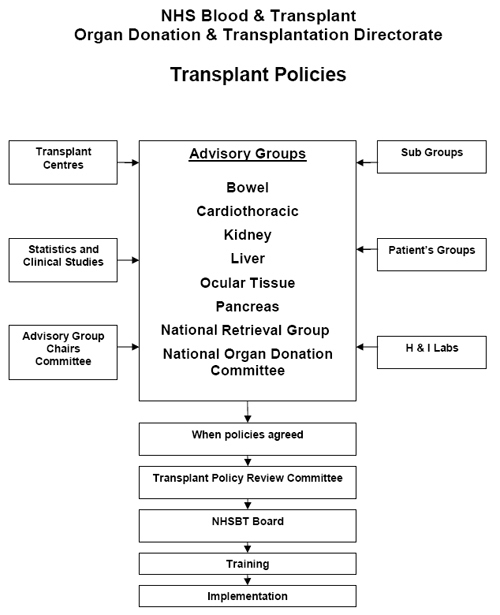 The most recent minutes and agendas for the solid organ advisory meetings can be found within the respective organ's section within Transplantation, quick links are available on the right hand side. Lay members are not clinicians and will not become involved with clinical decisions about individual patients. If a patient or a family member has a concern with a clinical decision, then they should raise this with the clinician concerned in the first instance and, if not satisfied, contact the hospital involved. Patients declined for transplantation may ask for a second opinion. If you have a comment to be passed to any lay member, please send your comment or question to: ODT.website@nhsbt.nhs.uk. Report an incident during the organ donation pathway. Register with us to become an organ donor.